A new bluesrock album with an intriguing genesis! 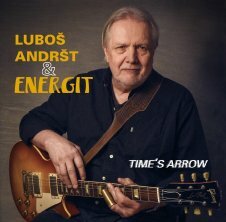 After several decades, the guitarist Luboš Andršt has returned to the repertoire that back in 1973 he intended to be featured on the debut release of his band, Energit. Yet the plan did not come to fruition, as at the time Supraphon did not give a chance to the formation made up of him, Ivan Khunt, Vladimír Padrůněk and Jaroslav Erno Šedivý. The current versions of the pieces, retaining the spirit of that time, have been recorded as a splendid memory, as well as a tribute to the prematurely deceased bass guitarist Padrůněk. Alongside Luboš Andršt, you will hear Jan Holeček (vocals, Hammond organ), Vladimír Kulhánek (bass guitar) and Jiří Zelenka (percussion), with the violinist Jan Hrubý performing as a guest on one of the tracks. The album is essential for those who lived through that time, and also a welcome lesson for the young generation, providing a sample of the very best Czech rock had to offer decades ago. It is a truly “vintage” recording, with the opening elements being historicising and the result coming across as attractively contemporary. Evident global influences are audible, yet it is a genuine Czech offshoot of the bluesrock scene in the early 1970s. Owing to the emigration of Khunt and Šedivý, and Padrůněk’s death, the album could not have been made at the time of their youth, hence today’s reconstruction serves to pay tribute to the musicians and their music. The booklet contains an extensive interview with Luboš Andršt and a set of archival and new pictures taken by Alan Pajer, who has photographed Energit since the very beginning. The circle has closed – let yourselves be struck by Time’s Arrow. Energit 1973/2017: blues-rock full of memories!